Fruit Trees For Community has been greening and feeding the community since 2010. Our program has partnered with twenty-nine organizations that do good in in the Valley, providing them with shady, beautiful and delicious fruit and nut trees. Robinson Ranch is one such organization, and they have certainly done a lot of good. Robinson Ranch began as an equine therapy program for adults and children with special needs, created by the vision of John Robinson in 2000. The program built its own momentum, with clients and volunteers pouring in from across the state. John revisioned his successful creation with the help of Jerry Riggs and Fred Colbert, bringing Robinson Ranch to where they are today. The Ranch’s unique Equine Therapy program is founded on the principle that, through working with horses, students can learn life skills that initiate change. 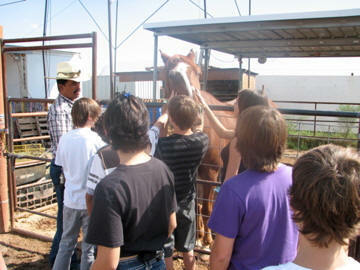 All aspects of horses and horsemanship are used in the program. Horsemanship skills are integrated with team building activities and experiential learning, to create unique programs with endless possibilities. Fruit Trees For Community is proud to give back to Robinson Ranch and honor all they do. FT4C trees are providing shade and fruit to Robinson Ranch, and according to John Robinson, some were planted by the kids themselves. Get the new FT4C App for Android!